Google has released a new free tool to create animated GIFs. Its name is Data Gif Maker and as its name is so straight to the point and well explains it, it is a simple generator of animations from data. Basically, Google wants to make it very easy for you to make a “fun” animation GIFs based on boring figures and data. Honestly, it looks quite attractive, because GIFs are more flashy than a simple chart or a capture of a spreadsheet. To create GIF with Google tool Data GIF maker follow the below steps. It is very simple to use as a comparison GIF maker. Go to the Google’s new Data Gif Maker tool site. Data Gif Maker is extremely simple. All you have to do is to fill the blanks with the data that to be compared and add the percentage that covers each one. Yes, it only works by comparing two variables, and each variable can be identified with a colour. You have the huge variety of four colours. Firstly, see that we have one term on the right and one on the left. Fill the left and the right blanks with the terms or names you want to compare. Enter the values with comma-separated. 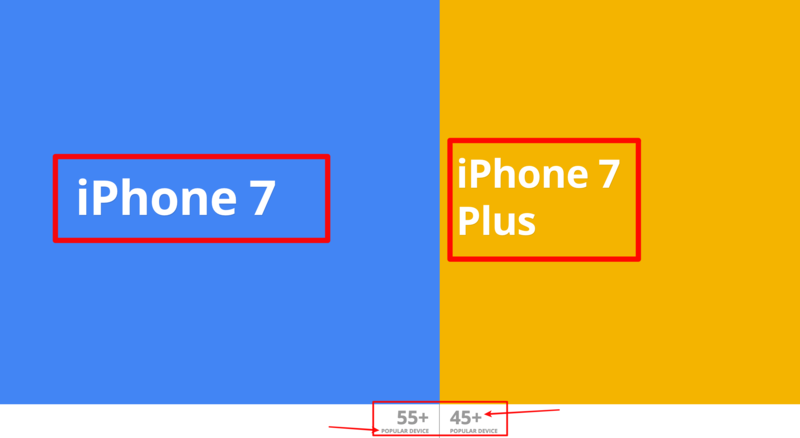 In the below image, I have entered iPhone 7 and iPhone 7 Plus as I want to compare which mobile is sold more. The numbers that are given are just my assumption. We have an option to change the colours of the display. If you like to change the colours you can do it by just clicking on the colour which is in circular form. For more clarification see the below image. Once you are finished with the colour, you can add the percentage, and you can write some explanatory text underneath. The maximum number of letters that are allowed in description section are 30 letters. Once you are ready, you can preview the animation by clicking on “Launch” (if it seems that nothing is happening, it is because you must click on the page to activate each part of the animation). To play the GIF, select Autoplay all option from OFF to ON and then Click on Launch Comparisons to play the GIF. If you are satisfied with your result you can click on “Download as” to download the GIF in reduced quality or normal quality. Of course, we should note that whichever option is chosen, processing is quite slow. It takes little more time to download the GIF. The total output of Data Gif Maker looks like as the below image. In the below image you can see the names which we used in the example, that is iPhone 7 and iPhone 7 Plus and I have given the number values of 55 to iPhone 7 and 45 to iPhone 7 plus. I thought to compare the popularity of the device. And to let the users know about this comparison, I have given the Popular Device in the description box. There you can see the output. This is how we can make comparison GIFs with Google’s new tool Data GIF maker. This is really very simple and mainly we can use when we want to compare two products. Data GIF maker provides 5 comparison boxes at a time. By filling all the five comparisons it might be useful to say the popularity, search, number of units sold, years comparisons. Awesome isn’t it? If you have any queries regarding the above method in making GIF using Data GIF maker, let us know in below comments. If you have already used this tool, share your experiences with our readers so that it might be more helpful. Which tools or software do you use to make GIFs Online or Offline?